date nights! or, i’m blogging and playing on pinterest while my husband watches gory films. lately our little nighttime devil has become kind of an angel when it comes to going down at night. p gives her a bottle of expressed milk around seven and i pump, and we’re both usually finished before eight. it’s ALMOST as if we have our lives back! so this week we decided to go a little crazy with films…we’re thinking about exploring the world of lovefilm, and had a blockbuster voucher so have had a different movie every night. let’s just say it’s nice to feel back in the loop again after having to wait six months to watch the hunger games because it conveniently came out just after s was born. did i mention that before? sorry, i was a little pissed. anyway, movie nights have been a really great way for p and i to spend a bit more time together. as you can tell by my current blogging, right? it’s not my fault, really i promise. he’s watching immortals (you know, the greek mythology bloodfest made by the same guys that did 300? me neither. i watched some guy get castrated and turned on the computer instead. ok so i made him watch one day the other night. let’s call it even.) and i’m catching up on the grownup world of facebook, online shopping, and pinterest. it actually feels really nice. pin of the day: loaded mashed potato cakes…if MODG approves then they’ve got to be good! 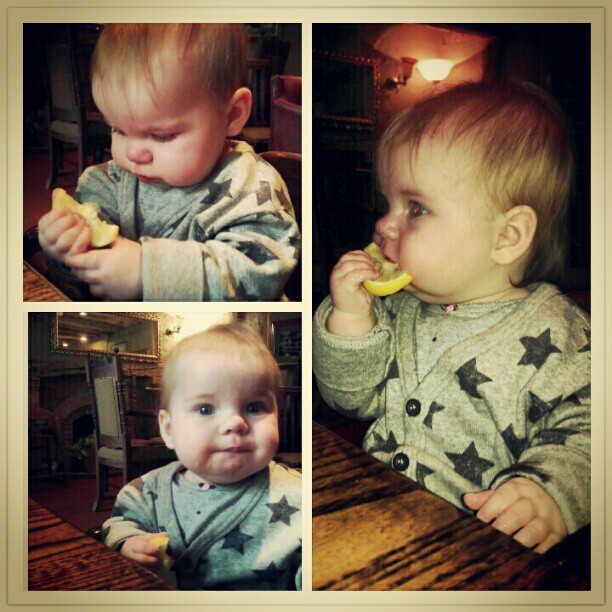 adorable photo (montage) of the day: crazy baby enjoying lemon. what?! ok, now for your suggestions…go!! !